Situated just a short drive from the glittering city of Las Vegas, the stunning natural beauty of Red Rock Canyon in Nevada sits in perfect contrast to the bright lights and opulent hotels of the Strip. With towering red rock cliffs looming ever-present over the desert landscape, the tranquillity of the area is seldom punctured, save for the rush of water emanating from the occasional waterfall or the sound of a wild burro braying for food. 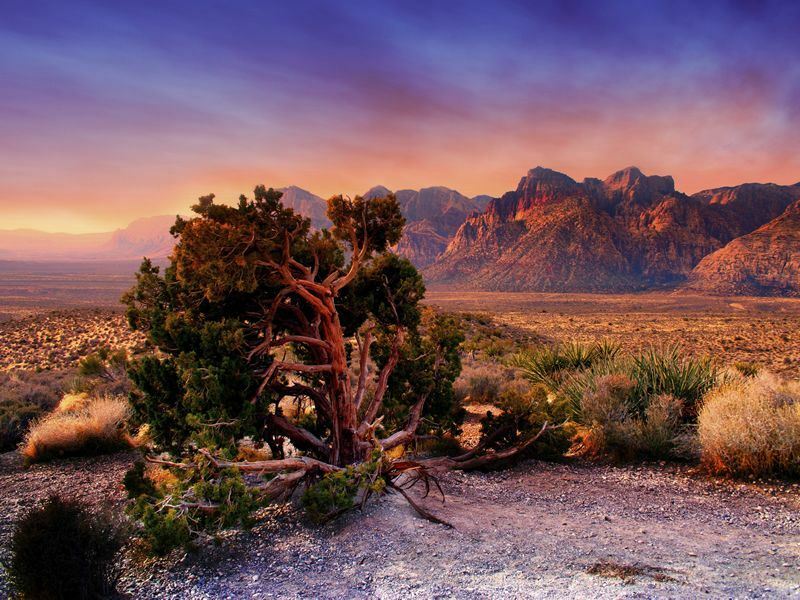 The majestic silence of Red Rock Canyon is the perfect antidote to the energetic buzz of nearby Las Vegas, making it a highly popular attraction. To explore Red Rock Canyon is to explore not only one of the finest areas of natural beauty in the whole of the United States but also life as experienced in the Old West. During the nineteenth-century, many wagon trains would pass through the harsh terrain of Red Rock Canyon on their way to California, on what was called the Old Spanish Trail. Today, the whole of Red Rock is a National Conservation Area, its craggy, scenic wonder and plethora of wildlife protected for all to enjoy. Undoubtedly, the best way of taking in all of the natural beauty that Red Rock Canyon in Nevada has to offer is by traversing through it on horseback. Taking a horse ride through the canyon is a highly popular activity for many visitors and for good reason. With countless dusty trails twisting their way through ever-changing rock formations, hiking on foot is only for the very fit. A leisurely horse ride is so much more relaxing, leaving you plenty of time to properly take in all of the truly magnificent scenery that surrounds you. A number of fully-guided horse rides are available at Red Rock Canyon, taking in various areas of scenic interest and catering for all standards of rider, from novice to expert. Whether you choose a shorter ride or opt for a more challenging, longer trail, the scenery will undoubtedly take your breath away and leave you hungry to experience the magnificence of Red Rock Canyon again. Most companies operate their guided trail rides throughout the year but, as Red Rock is part of the Mojave Desert, be sure to wear plenty of sunscreen if you go during the summer season! Protecting yourself from the Nevada sun is imperative no matter what activity you undertake at Red Rock and, with the canyon now being a National Conservation Area, there is certainly no shortage of activities for visitors to enjoy. The Official Visitor Centre is one vast outdoor exhibit, giving tourists a fascinating insight into the history of the area, in addition to providing enlarged maps of the various hiking trails and details of the abundant wildlife that can potentially be spotted. Animal lovers will not be disappointed by Red Rock Canyon, as the area is a haven for creatures such as wild burros, ground squirrels, deer and rattlesnakes. Fancy the outdoors, but don’t want to take a helicopter or airplane to get there? A white, stretch limousine will pick you up from your hotel and will then transport you to the marriage licence bureau to obtain your marriage licence, after which you will be driven to beautiful Red Rock Canyon, an outdoor paradise famous for it’s red sand rock beauty and desert grandeur. From a vantage point that overlooks the Red Rock Valley, you will exchange your marriage vows amidst a protected environment that offers a pristine backdrop for wedding photography. We recommend morning or late afternoon for this breath-taking matrimonial experience! For an oasis of calm away from the neon lights and seemingly never-ending party that is Las Vegas, Red Rock Canyon is a must-visit that will surely take your breath away. Article written by Lita List.